I recall a conversation with a woman who told me that she did not eat Italian food because it was too fattening. I had to restrain myself! You’ll have to forgive me, but in this post I’ll be a bit defensive, so bear with me. I’ll get to my Mom’s Eggplant Parmigiana soon! We were speaking mostly about restaurant food so I imagine she was referring to your average over sauced, ridiculously thick layer of cheese topped lasagna, veal or eggplant parmigiana. I also got the feeling she didn’t cook very much. I tried to explain that this is not how Italians eat or cook and many of the dishes found in some Italian restaurants are North American interpretations of Italian food. Italian food is not very complicated, focuses on simple, fresh ingredients and is NOT more fattening than any other cuisine. I had never heard of Fettucine Alfredo, béchamel or cream sauces (although creamy sauces are found in some Italian cooking) until I saw them on the menus in restaurants They simply were not a part of our diet. We rarely ate out in restaurants when I was young. Whenever we did I’d have to hear my parents speech about how much food they could have bought for the same cost! They just didn’t see the point. I suppose I understand them now, more than ever. I’d like to make my point with my mother’s eggplant parmigiana. The least saucy, cheesy, eggplant parmigiana I’ve ever eaten. First of all, although the eggplant in this dish is typically fried, my mother has been baking it ever since I could remember. This dish is less saucy than most parmigiana dishes using only 1 cup of sauce in the whole recipe. She adds a thin slice of mortadella and sliced hard boiled eggs on each layer. The emphasis here is on adding layers of flavor and not overdoing any ingredient. So the result is a lighter parmigiana not swimming in sauce and thick layers of mozzarella. This recipe makes four portions as a side dish. Double it if you’re serving it as a main dish. Add a salad and some fresh bread and you’ll have a great meal. Enjoy! 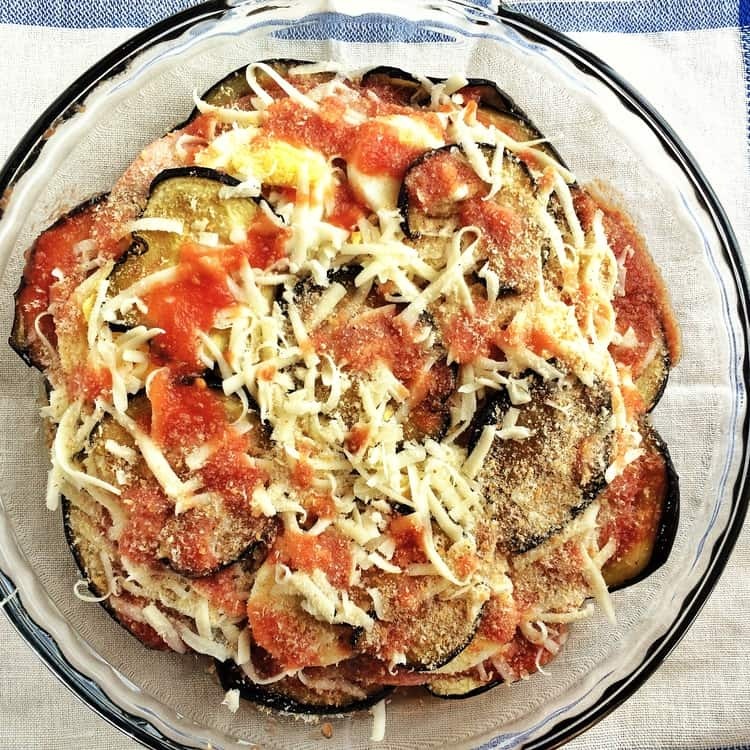 This is an authentic eggplant parmigiana recipe, straight from my mother's kitchen! 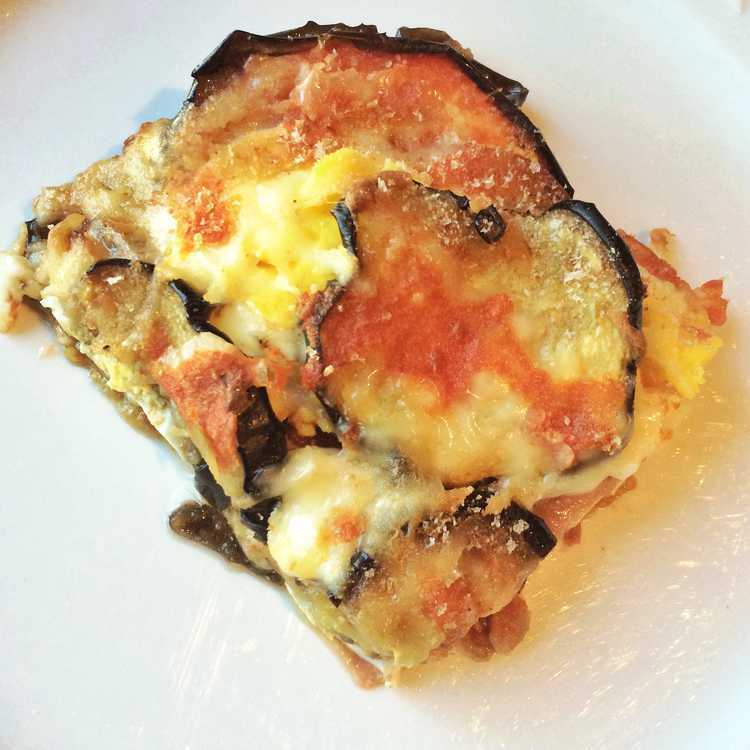 Not your typical commercial oversauced parmigiana, my mother's recipe features surprise ingredients such as hard boiled eggs and mortadella. A must try! Preheat oven to 350°F. Begin by removing the bittern juices from the eggplant. 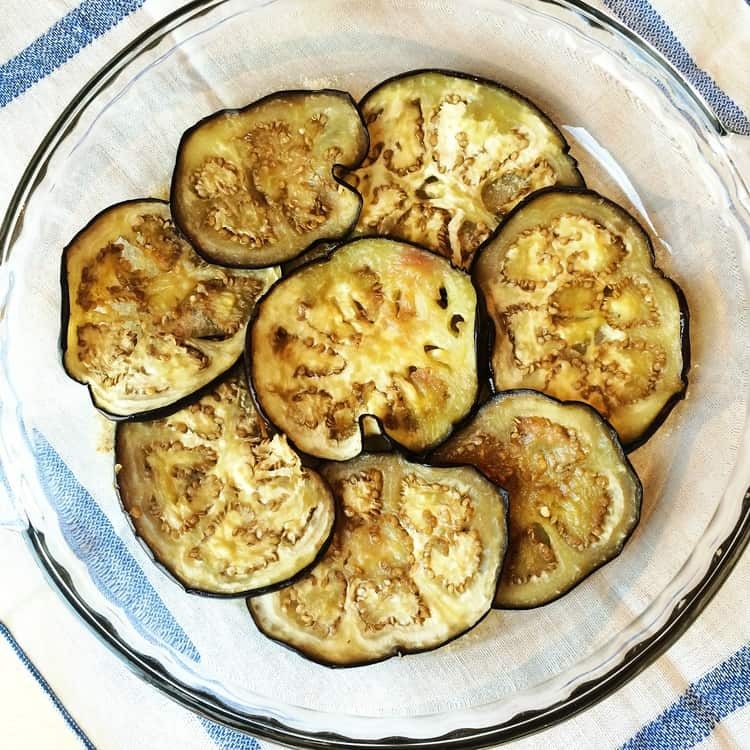 Slice eggplant into 1/4 inch thick rounds. Salt the slices and place in a large bowl. Cover with water, place a plate on top of the eggplants and weigh down with a heavy object (I use a box of salt). Let sit for 20 minutes, then drain water and rinse well. Pat the slices dry. Place on a baking sheet covered with parchment paper, brush both sides with olive oil and salt lightly. Bake for about 20 minutes, flipping halfway. Oil the bottom of a 10 inch circular or square baking dish. Spread a thin layer of breadcrumbs at the bottom of the dish. Layer eggplant rounds, slightly overlapping the slices so that the bottom is completely covered. Spread 1/3 of the tomato purée over the eggplant, next add shredded mozzarella, top with a slice of mortadella and 1 sliced hardboiled egg. Continue layering with the remaining ingredients reserving 1/3 cup of tomato purée and a couple of tablespoons of mozzarella for the top. Top with a thin layer of breadcrumbs and drizzle with olive oil. Bake at 350°F for half an hour, until the top is golden and the cheese is bubbling. Nadia, I couldn't agree with you more. 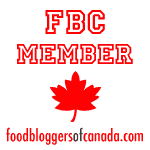 Since I'm in Canada I'm trying to let people know the real Italian cooking, not the adapted north american version :-) . 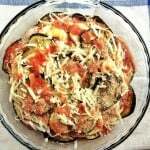 As for this eggplant parmigiana, it reminds me of my grandma's lasagna recipe, she always added mortadella and a boiled egg. Delicious! And so good looking! Hope you enjoyed your Italian vacation. We're going in September :-) . Thanks Nicoletta! We truly need to educate people about how simple Italian cuisine really is. We totally enjoyed Italy and can't wait to go back. You're so lucky to be able to go in September. That is the ideal time of the year to visit!